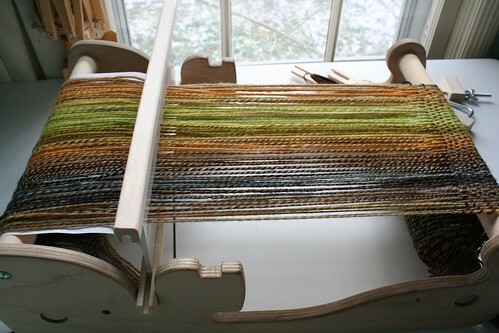 weaving in progress, originally uploaded by earthchick. This was going to be a present for My Old Man for last Christmas. But I ended up with major tension problems, with the left side crazy-tight and the right side super-loose. I got some good advice in the Hello Yarn forum on Ravelry – it seems that a big part of the issue is that I wasn’t using a wide-enough warp separator. Anyway, the problems were significant enough that it turns out the only real solution is to totally undo the warp. GAH! You know what? Unweaving is NOT FUN. If this were any yarn but handspun, I would totally just cut it off and be done with it. But it is handspun, and I really want to make this scarf. So unweaving is what I need to do. I’ve set it aside for … awhile (obvs). But I’m hopeful that I can get it unwoven over the next few weeks and then maybe weave the scarf in time for Christmas!